UC President Janet Napolitano outlines key steps for expanding access and opportunity for California students at the San Francisco Commonwealth Club on March 7, 2018. Work with UC’s Academic Senate to extend a guarantee of admission to all qualifying California Community College students at one of UC’s nine undergraduate campuses. Streamline the degree pipeline, thereby increasing UC’s four-year graduation rate from today’s 64 percent to 70 percent by the year 2030. That would allow 32,000 more undergraduates to earn degrees. Partner with state lawmakers and the California State University system to tackle the college graduate gap to ensure that California has the educated workforce it needs in the coming decades. 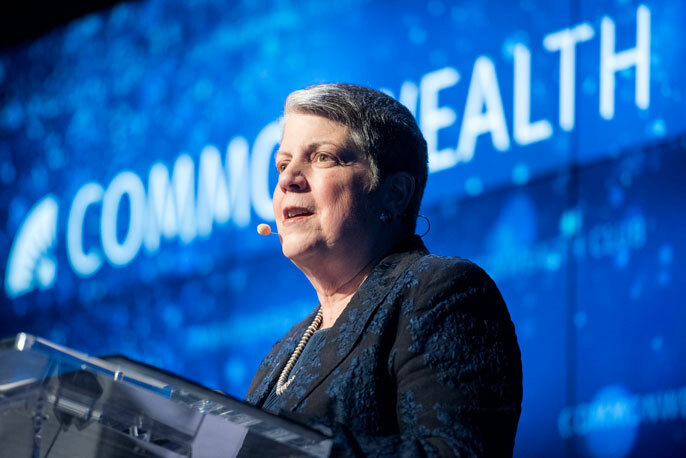 University of California President Janet Napolitano, in a speech marking UC’s 150th anniversary, called on UC and state leaders to help the university meet the growing demand for a UC education. Speaking at the Commonwealth Club of California on March 7, Napolitano outlined key steps that could make room for tens of thousands more Californians, including the development of new policies that would guarantee UC admission to qualified community college transfer students. She called on the Academic Senate to begin exploring ways to provide such a transfer guarantee, with the goal of having the new policies in place as early as fall 2019. She also called on the university’s chancellors to streamline the degree pipeline, boosting the percentage of students who graduate in four years from 64 percent to 70 percent by 2030. That goal is achievable and the payoff would be great, Napolitano said. Students would reduce their college costs by graduating sooner, and UC would be able to produce an additional 32,000 undergraduate degrees over the next dozen years — roughly the equivalent of adding another campus. Both steps would help address an expected shortfall in college-educated state residents. But the solution also requires California lawmakers working with UC and CSU on ways to further expand opportunity. California and its students would both reap big benefits from the renewed investment in UC, she said. President Napolitano in discussion with Hans Johnson, director of the PPIC Higher Education Center, at the San Francisco Commonwealth Club, March 7, 2018. Napolitano noted that the university has gone to great lengths to increase enrollment of California students over the past several years, without sufficient enrollment funding from the state. UC committed to adding 10,000 more Californians by 2018-19, a goal it has already reached, and is now serving more California students than at any time in its history. “UC is grateful for the state support we’ve received in recent years, following devastating budget cuts during the Great Recession. Yet we still do not have sufficient state support to pay for increases in enrollment, the necessary expansion of our campuses, or the growing needs of our students,” Napolitano said. “In fact, UC educates 90,000 more students today than we did in the year 2000, yet our state appropriations have remained flat,” Napolitano said. She went on to explain that if UC’s per-student funding were the same today as it was in 2000, the university’s state appropriation would amount to more than $7 billion, instead of the $3.4 billion it currently receives. More public investment in the university would help it meet the rising demand for a UC education and align with the state’s vision when it first created the university in 1868, namely that UC would provide a top-notch education to all who qualified academically, regardless of income or background.